With an almost endless array of bits, attachments, and accessories, miniature power tools can be called on to do just about any job. Mini power tools can be used for drilling, routing, sawing and cutting, shaping and smoothing, engraving, and grinding and polishing. Miniature power tools can accommodate either twist drill bits or bottom-cut router bits. As a general rule of thumb, bottom-cut router bits are best used on wood, while twist drill bits can be used on wood, metal, and plastic. Another benefit of twist drills is that their pointed tips and spiral flute design remove waste from the hole. Routers are used to cut moldings, grooves, and dadoes in both wood and plastic. Routers come in a variety of shapes and sizes, for just about any type of groove or edge molding. Standard router bits made of high-speed steel work well for cutting wood and soft plastic, while tungsten carbide bits are stronger and can cut wood, plastic, and metal. 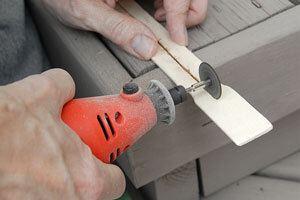 A router based attachment and a router table can easily convert your miniature tool into an easy-to-handle router. A number of different saw blades and cutting attachments are available for miniature hand tools. For those who are interested in precise freehand work, circular saw blades and cutting discs can be used. If you're cutting wood, the thinner saw blade is most appropriate, while cutting metal, stone or ceramics may require the thicker cutting disc. For those who want to shape and smooth work, there are many different cutting and sanding accessories that can be attached to the miniature power tool. Sanding drums and discs are able to smooth both wood and metal, while cutters made with abrasive materials but without teeth or cutting blades are also good for sanding. For rough shaping, high-speed cutters called rasps and burrs can be attached to the miniature power tool. When fitted with the correct cutters, a miniature power tool can quickly be transformed into an engraving tool. Cutters with diamond points are able to engrave glass and stone, while tungsten carbide cutters are best used for metal. Aluminum oxide grinding points can be attached to your miniature power tool to smooth, shape, and sharpen. These attachments come in a variety of shapes, including round, flat, and cylindrical, depending upon your goals.